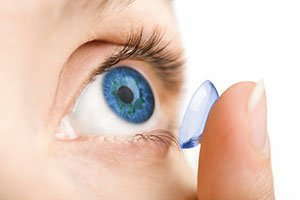 Bifocal contact lenses are a type of contact lens that combine two different prescriptions in the same lens. One component corrects nearsightedness and the other prescription addresses farsightedness or farsightedness. Several types of bifocal contacts are available; your eye care provider can help you determine which option is best for you. What Types of Bifocal Contacts Are Available? The reading power is in the center of the lens, and the distance (far vision) is on the outside. Or, the distance could be in the middle with the reading on the outside. The distance is on the top, and the reading power is on the bottom, similar to bifocal eyeglasses. These contact lenses are weighted at the bottom to keep the reading power on the bottom. The reading and distance powers blend from the outside towards the center. What Kind of Bifocal Contacts Should I Wear? What Should I Expect During the Adjustment Period? Some people adjust quickly while others need some time. You might notice that images jump when you switch between close-up and distance vision, or you might see a ghost image when you read. You might see a halo around lights, or your vision might change when the lens moves on your eyeball. If you experience any of these quirks, talk with your eye care provider. Sometimes, these effects are part of adapting to your new corrective lenses and will go away with time. However, in some cases, you might need to try a different type of lens. If you're having trouble seeing clearly both up-close and at far distances then bifocal contact lenses offer a convenient alternative to bifocal eyeglasses. It may take longer to adjust to bifocal contacts than to glasses, but many find that it's a worthwhile investment.